Five years ago, colleagues looked at me like I might have had a few screws loose when I told them I wanted to pilot a project known as CoCoRaHS in Florida. It had been such a huge hit out west, I figured that there had to be people in the state that were as enthusiastic as myself about weather and would be interested in helping measure rain. And I was right: I wasn't the only one! Some observers have come and gone, lasting a few years or less, and each report they have left is still valuable. 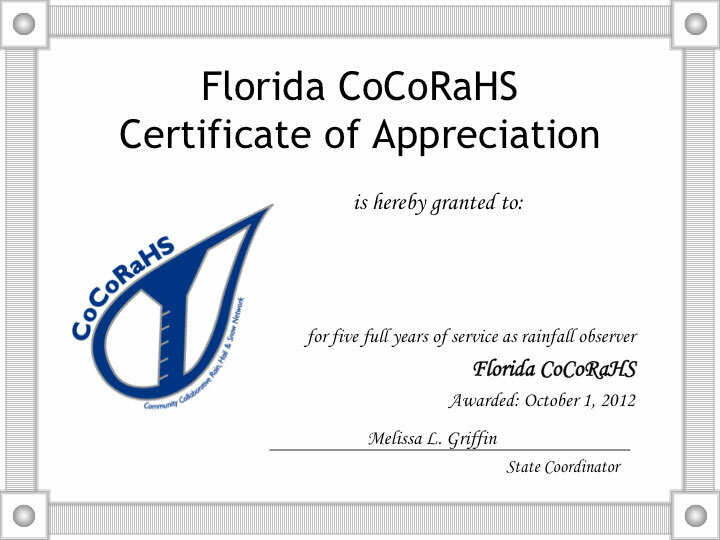 I pulled up the observer report this morning, figuring that I would highlight those who have stayed with CoCoRaHS for the last five years and send them a certificate of appreciation for their dedication. October 1st also marks the beginning of a new water year. The water year is an approximation for the best 12-month period that spans the cycle of water storage and water usage. This cycle is particularly well known in the western United States, where snow begins to accumulate at high elevations in October and melts during the following spring. This annual cycle, when areas receive more precipitation than is evaporated from October through March, takes on different forms across the entire country. Here in the southeast U.S., the winter rains help recharge our aquifers, wells, ponds and lakes. If you are interested in looking at the data for your station over the 2012 Water Year, there is an option available to review your summary and make any corrections that may be necessary before they are regenerated at the end of October. If you have any questions about End of Water Year Reporting, please feel free to send me an email. In the past few months, they have covered topics like: extreme rainfall, jobs in meteorology, wildfires and hurricane analysis/prediction. Most 'WxTalk Webinar's last about an hour and a half and allow for participants to ask the guest speaker questions. Rainfall totals across the state varied in September (Table 1), though most of the coastal communities in Florida saw below normal precipitation. 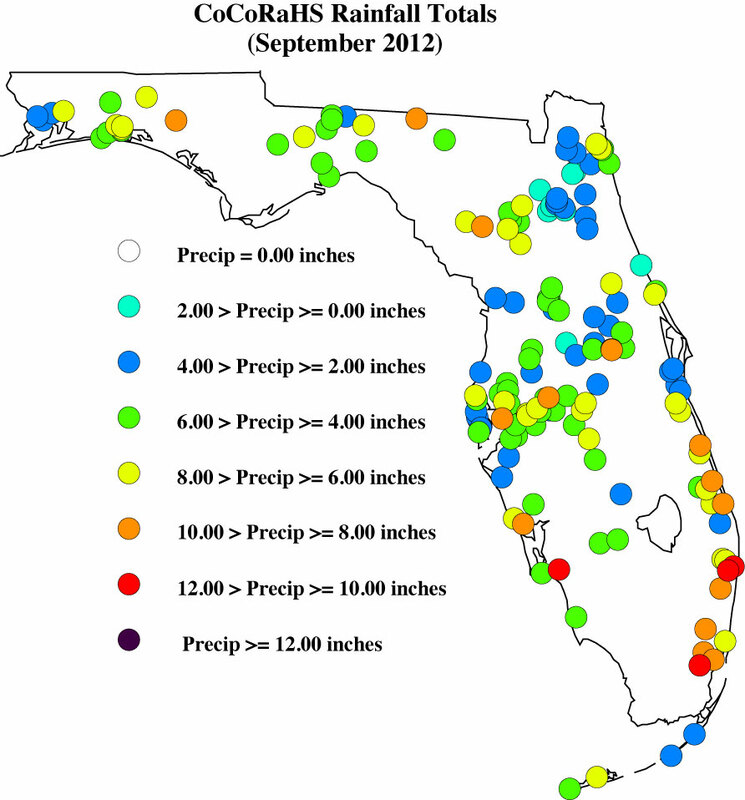 Areal patterns of monthly rainfall relative to normal are depicted in Figure 1 and show how portions of north Florida reported near to above normal rainfall, along with areas southwest of Alachua County and interior portions of South Florida. Only a few precipitation records were broken in September (Table 2). 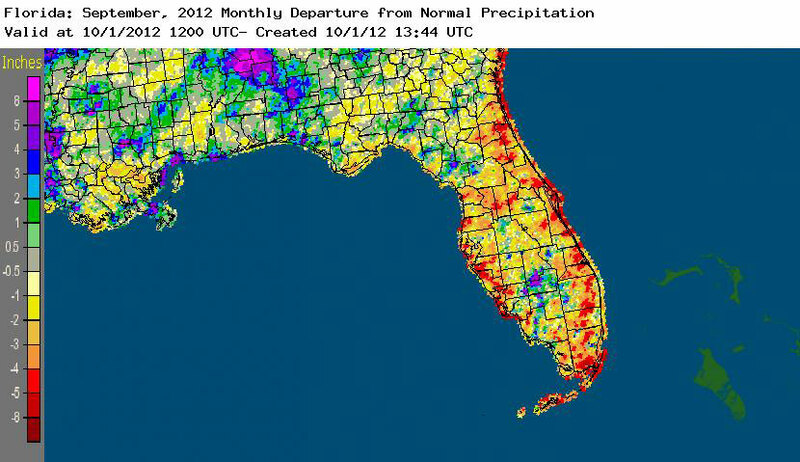 Year to date (01/01/12 to 9/30/12) rainfall totals from some locations along the southeast coast (i.e., Miami, West Palm Beach, and Fort Lauderdale) have already reported rainfall amounts above their average annual totals and with 3 months left in the year; it could mean that 2012 may be the wettest year on record at some locations. Table 2: Select daily rainfall records (inches) broken during September (compiled from NOAA, NWS). 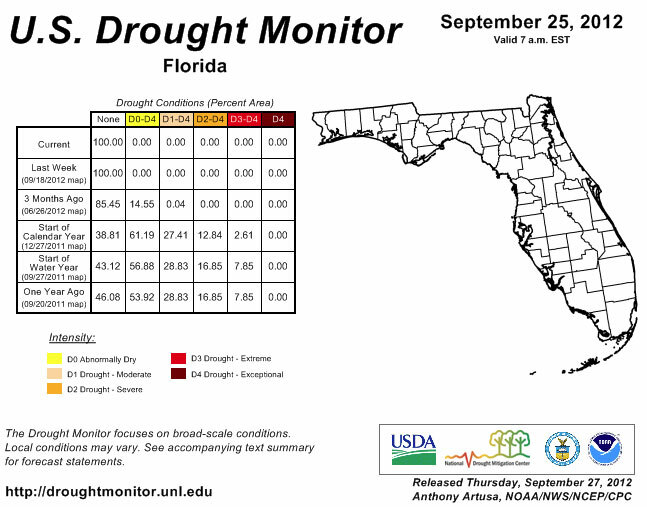 Since the September 4th release of the Drought Monitor, conditions have not changed. The state remains drought free, despite some areas having below normal rainfall for the month. Fall is a typically dry period for the state, though passing fronts and the occasional sea breeze storm will bring rainfall to portions of the state. Water levels reported at Lake Okeechobee have risen from 14.24 ft to 15.63 ft. The Climate Prediction Center is still predicting El Ni�o to form and last through the winter of 2012-2013. El Ni�o would bring cooler temperatures and increased precipitation to Florida. A few reports in Florida were flagged and required some additional information during September. I appreciate how understanding the contacted observers were, along with how quick they were to reply to my email. Please remember if you receive an email from me with the subject line 'Question About Your Recent CoCoRaHS Observation', please take a moment to answer me back. And if you have any questions, please feel free to contact me.